Thanks to Ken Shirriff’s blog we found a lot of information about Magsafe connector. Two pins are power, two pins are ground, and the middle pin is a data connection to the laptop. Inside the Magsafe connector is a tiny chip that informs the laptop of the charger’s serial number, type, and power. The laptop uses this data to determine if the charger is valid. This chip also controls the status LEDs. 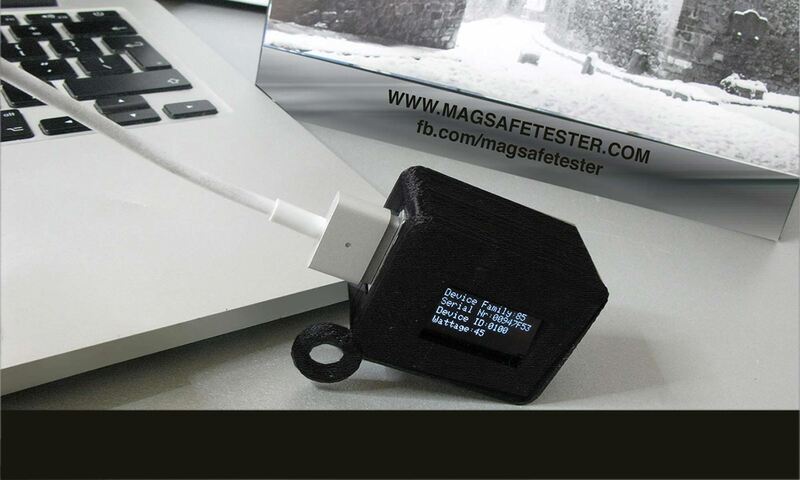 There is no data connection to the charger block itself; the data connection is only with the chip inside the connector.We make some pictures of genuine magsafe adapter as Ken say’s there is a DS2413 and chip is powered by parasite current thru data line. It’s very easy to read the ID number from a Magsafe connector using an Arduino board and a single 2K pullup resistor. Our goal is to make small and simply tester that can read DS2413 1-Wire Dual Channel Addressable Switch.It is based on arduino mini and a simple pcb and when connect magsafe 1 or 2 adapter it will start blink green red and amber.Tester will change colors only if adapter is genuine if adapter is Replacement it will light just green and red. On genuine adapters there is delay before blink because adapter will start main supply after charger detects the power input has been pulled low, but not too low. (A short or a significant load will not enable the charger.) After exactly one second, the charger switches to full voltage (14.85 to 20 volts depending on model and wattage). All this information is only for genuine power adapters we test a lot of non genuine adapters light green and red never seen amber. So we decided to open non genuine cable and see what’s inside. Well there is big difference between genuine and non genuine cable as we can see there is small 6 pin chip and this is only resemblance. This chip is emulation of ds2413 it is pic10f200 they use 2.7k resistor and zener diode on 3.3 v from power supply to power it that is why you will never read it when connect and try to read as ds2413 because pic will be without power. Pin 1 is connected to one led pin 2 is gnd pin 3 is connected to other led pin 4 is communication with laptop pin 5 is power. some truly prime posts on this internet site, saved to bookmarks. Hey very cool blog!! Man .. Excellent .. Amazing .. I will bookmark your site and take the feeds also…I am happy to find numerous useful information here in the post, we need develop more strategies in this regard, thanks for sharing. . . . . .
We are small company based in Bulgaria which is specialised in laptop and electronics repair.